So, some friends of mine just had a baby! Congratulations! And his name? 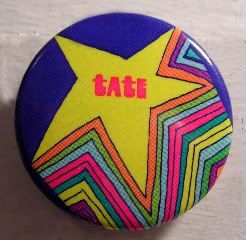 Tate! How cool is it that I have a magnet just for him! Ophelia by John Everett Millais - a Pre-Raphaelite painting that's just gorgeous viewed up close. And, The Last Sleep of Arthur in Avalon, the last painting of Edward Burne-Jones that's just gorgeous viewed from afar, as seen in this Telegraph pic. Oddly, Hamlet's sister, the drowned Ophelia, is the most popular postcard that the Tate sells - and of course, I totally bought one. Even though I can't stand Hamlet, there's just something about this painting that's oddly haunting. Even more odd, since December when I saw the painting, I was convinced that we used it as cover art back in my publishing days a dozen years ago. It's not, but the cover of this Patricia A. McKillip novel is very close. Hello, false memory. For Arthur, the Tate had the chance to purchase the painting for a steal 40 years ago, but let it go, and now, it's owned by a museum in the Museo de Arte de Ponce in Puerto Rico, and it's worth millions now. And, because the Museo is undergoing renovations, they've loaned it to the Tate and now the Prado, having signed, sealed and delivered it, in a hugely complex and kinda supercool process. 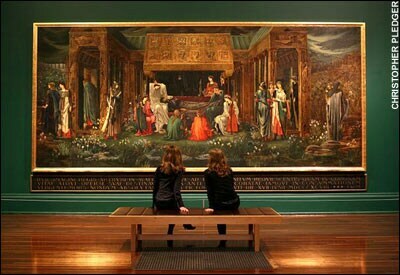 I mean, the thing's like 9 feet x 21 feet big, and took Burne-Jones something like 17 years to paint...he was supposedly working on it right up to his death! Ooof, such somber works for such a happy occasion! Eh, it's all very circle of life-y, I guess. So, these two paintings were definitely worth the museum drop-by. Also, definitely worth the magnet! Especially now - welcome, little man Tate! Yep. He's a pretty lucky kid. Tate's a great name.